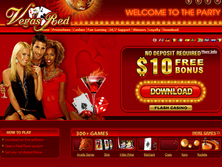 With multiple deposit bonuses and more than 100 casino games, VegasRed is an exceptional online casino that offers 6 different languages and a top-notch casino software app that is available for download or flash play. It's worth trying out, just for the 1st deposit bonus (and 2nd and 3rd and 4th...). Instant First Deposit Bonus: When you make your first deposit at Vegas Red, you will automatically be credited a 100% return on your deposit, up to $200. In other words, if you deposit $50, you'll have $100 to play with immediately. High Roller Bonus: If you are high roller though, forget that. If you make a first deposit of $1600 or more, you will instantly receive the $888 High Roller Bonus in your Vegas Red account. 2nd, 3rd, & 4th Deposit Bonuses: But that's not all! No matter which first deposit play bonus you take advantage of, you are still entitled to some more play bonuses. 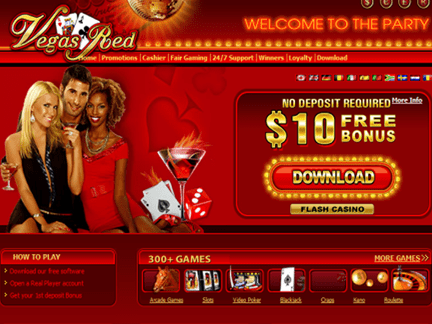 When you make your second deposit, you will get a 25% free bonus instantly, as well, up to $200. There's more-keep depositing and you'll get a third instant bonus at 50% of your third deposit, up to $200. Furthermore, on your fourth deposit, you can get another 100% deposit bonus, up to $200, as long as you have been credited the maximum bonus on all three previous bonuses. Keep in mind, though, that these bonuses are for playing and wagering only (not withdrawing), and you must wager 8 times your deposit + your bonus before you cash out, or your bonus and winnings will disappear. If you are still alive after all that, you can receive the $222 Extra High Roller Bonus, if you have earned the max bonus on the previous four deposit bonuses. The Monthly Alternative Payment Bonus: Alternatively, if your preferred deposit method is one of the following: Click2Pay, ClickandBuy, Webmoney, EcoCard, Moneybookers, MyCitadel, Paysafecard, UsemyBank, or Instadebit, you can get 10% of your deposit back. Or, if use Instant Wire Transfer, Ukash, or Bank Transfer, you'll get a 15%. The minimum deposit is $50. Moneybookers also offers a 125% BONUS up to $100 if you make your first deposit via Moneybookers.